Most beaders gravitate towards one bead stitching technique or another. When it comes to bead-woven earrings, Cara and I found that we typically prefer to work with a single needle and thread versus techniques that utilize double needles (or two clear mono-filament lines). 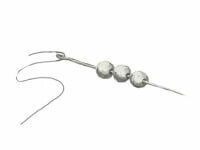 As such, most of our bead stitch earring patterns use a single thread and needle technique (unless we indicate otherwise). Other than that, you can tell from the sheer number and variety of stitch earrings we offer that we love to make bead woven earrings in just about every stitch you can imagine, from peyote stitch earrings, brick stitch earrings, herringbone earrings, to Russian leaf earrings, right angle weave earrings, SuperDuo earrings and countless creative variations of common beading stitches. Please note that our stitch earring patterns are not sorted by the type of stitch used on this page, because many of our earring designs use a variation (common or original) of well-known stitches, or are completely original designs that don’t clearly fall under a particular type of beading stitch. If you want to view patterns by bead stitch used, just visit our bead stitch techniques page. Remember, all of our earring beading patterns will hold your hand every step of the way, ensuring you’ll have fun and will be successful with your handmade earrings - we guarantee it! Thank you for shopping Simple Bead Patterns and, as always, bead happy!